I’ve been giving a great deal of thought lately to Mary Magdalene. My best friend from college to the present day says that Magdalene is her scripture heroine, and as with most things Anna comes out with, I considered it a very wise and admirable choice. I have been thinking of Mary a lot since last week, stuck in a tunnel on public transport, I was once again listening to the Lamb of God soundtrack I love so much. The track titled Mary Magdalene struck me. As I have been studying Mary, I have decided to love her most for two special occasions wherein she represents the faithful disciple, who truly understood who the Saviour was. The first occasion preceded the difficult and impending final days of Christ’s mortal journey. Mary spent approximately a years worth of wages on the most expensive and pure oil money could buy. As recorded in Mark, she presented the oil to anoint Christ “in acknowledgement of His impending death and subsequent anointing with spices” (here) as was the tradition of the time. 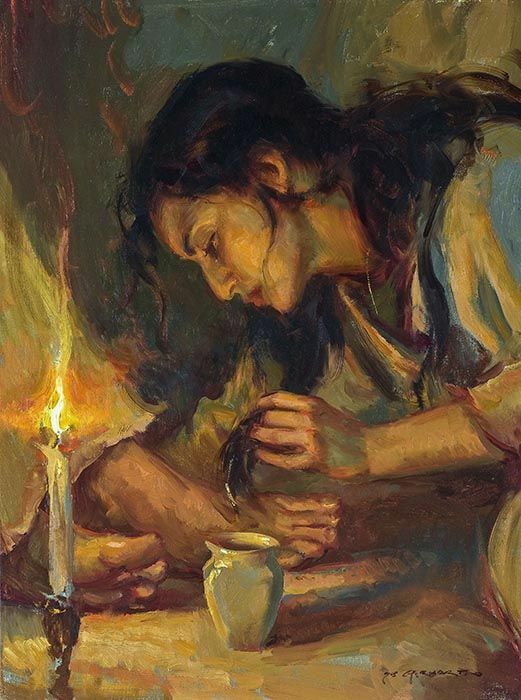 She took some oil to anoint the Saviour’s feet, and dried His feet with her hair. In that time, “one anointed the head of a live person and the feet of a corpse” at a typical burial. The reaction of the apostles was a mixture of confusion and disdain that she would spend so much money extravagantly. To which, the Christ said, “[Mary] hath done what she could: and this which she has done unto me, shall be had in remembrance in generations to come, wheresoever my gospel shall be preached; for verily she has come beforehand to anoint my body to the burying” (JST, Mark 14:8; Matthew 26:12–13). Mary is acknowledged by the Saviour to have been observant to revelation, and clearly testifying that He was the Christ. She was believing and accepting of His role for the children of God: He must atone for the sins of mankind, and die for them. She is the first acknowledge this, and she responds in faith and humility. “To anoint the head of a guest with ordinary oil was to do him honor; to anoint his feet also was to show unusual and signal regard; but the anointing of head and feet with spikenard, and in such abundance, was an act of reverential homage rarely rendered even to kings. Mary’s act was an expression of adoration; it was the fragrant outwelling of a heart overflowing with worship and affection” (Jesus the Christ, 512). The second occasion of Mary’s great faith and exemplary discipleship I have chosen to treasure is what is conveyed in the music that filled my delayed journey on the tube last week. This song, intermittently supplied with scriptural references and narration, tells of Mary’s greeting of the Saviour on His return from death. 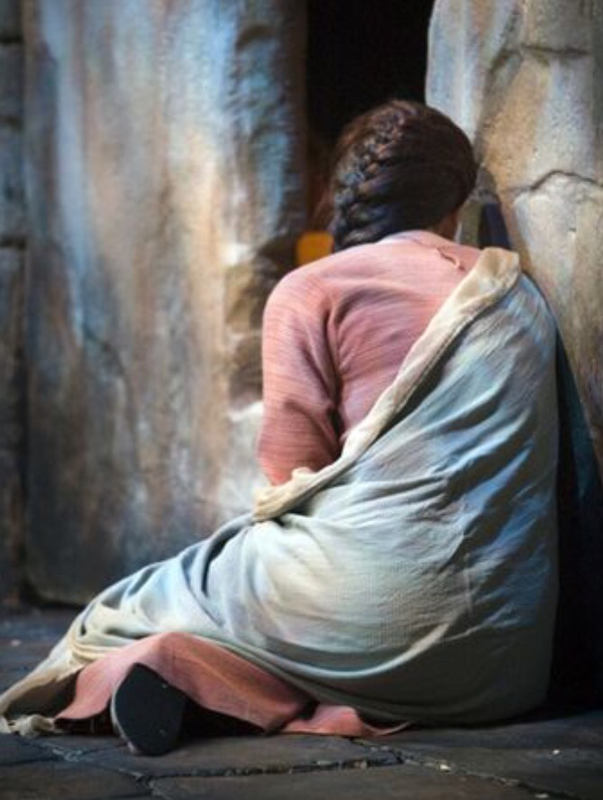 Mary Magdalene early unto the sepulcher where they had lain Jesus. The sepulchre, and know not what it meant. What have they done? Removed Him? What have they done? Mary impresses me as a disciple of Christ because she seeks after Him urgently, without delay. The sun had not even risen, yet she- probably with little sleep, probably exhausted from staying by His side during that difficult and painful execution- rushes to continue to be in His presence, even though to her He was not living. When all others, though still in grief, had left that place and were in their own homes, she of them all sought Him out, eager to be His steward. Her motive was service: to continue to bathe His body in fragrant oil, the treatment of a King. Come and see! They have taken our Lord away! Place by itself. Then the disciples went away again unto their own home. 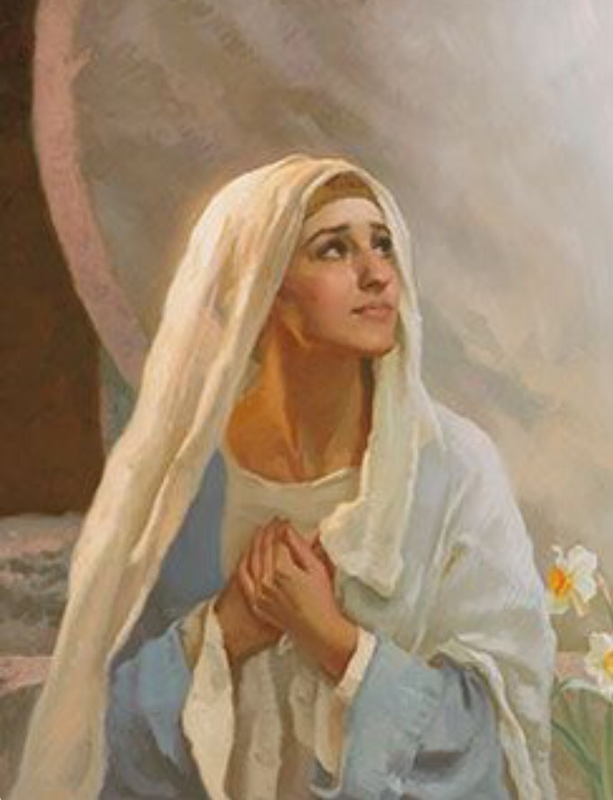 Mary next seeks the counsel of her associates and fellow followers and leaders. They together look and behold a miracle: folded sheets in an empty tomb. The careful preparation of the linens rather than strewn and discarded cloth suggests the deliberateness of action. I wonder why the others left this scene, the last room that held a man who had performed miracles- who had even himself raised the dead in their presence. Mary stays. She has no explanation- but she stays. She waits. Two angels in white sitting where the body of Jesus had lain. And they say unto her, Woman, why weepest thou? Where He is, I know not. I know not where they have laid him. Gardener. Jesus saith unto her, Woman, why weepest thou? Whom seekest thou? Tell me where thou has laid him, And I’ll take him away. I love Mary’s determination. She’s committed to Christ. I don’t even know if she has a game plan for “taking Him away”, being probably much smaller than He, and left alone by her friends. How could she manage that?! My God, and your God. I tried to imagine how Mary must have felt upon realising she was speaking to the Lord; to her friend. Joy, gratitude, exhilaration, awe, relief, security, comfort. She chooses to respond to His personal call using the name, “Master.” Mary Magdalene constantly testifies of who the Saviour really is. She seeks, she waits, and she acknowledges his calling as the son of God, the Saviour of all mankind. Today, let me add that we need women who know how to make important things happen by their faith and who are courageous defenders of morality and families in a sin-sick world. We need women who are devoted to shepherding God’s children along the covenant path toward exaltation; women who know how to receive personal revelation, who understand the power and peace of the temple endowment; women who know how to call upon the powers of heaven to protect and strengthen children and families; women who teach fearlessly. Surely Mary embodied this ideal. How diligent she was in her belief, in her faith. How hopeful a legacy she lent to womankind. Hers is a womanhood patterned after our Heavenly Mother and Eve, our first mother on Earth! It’s important to note Christ’s concluding cords to Mary, “I ascend unto my Father; and to My God, and your God [emphasis added].” Just as Mary continually identifies who the Saviour really is, so He identifies Mary as one of God’s fold: she is an acceptable disciple, a covenant woman, a daughter of God; and just as she knows who Christ is, so she knows who God really is.